Award-winning restaurateur Ashok Bajaj of Knightsbridge Restaurant Group is pleased to announce the appointment of a new head chef for Rasika West End. Rakesh Singh has been tapped to lead the kitchen under the direction of Group Executive Chef Vikram Sunderam, who opened both Rasika locations with Bajaj, and created the recipes for the company’s first cookbook released in October 2017, Rasika: Flavors of India. Guests will experience a selection of new dishes created by Singh on the popular seasonal menu of this landmark restaurant, which will still be spearheaded by Sunderam. Singh hails from Patna, the northeast region of India. 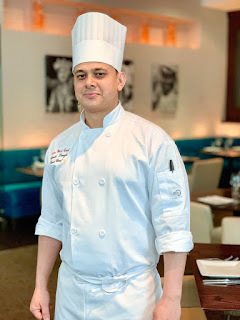 He most recently served, from 2016 to 2018, as the executive chef of The Westin Hyderabad Mindspace in Telangana, India, a Marriott International property with 427 rooms and eight food and beverage venues. During this period in his career, Singh was awarded the ACE Executive Chef among Marriott’s Full-Service portfolio. He joined The Westin Hyderabad, Mindspace resort in 2011, as chef de cuisine when the hotel was under the Starwood Hotels and Resorts management, climbing to the executive chef role during his tenure. Prior to joining Starwood, Singh served as sous chef and then head chef, from 2009 to 2011, for two Michelin one-star restaurants, Tamarind and Amaya, both located in London, England. He gained his early culinary experience at ITC Hotels, as a sous chef and junior sous chef from 2006 to 2009 working in Mumbai, India. New additions to the menu at Rasika West End include Smoked Eggplant Golgappa with cilantro, tamarind and pomegranate, Scallop Moilee with coconut, ginger and green chillies; Duck Galouti, smoked duck with cashew nut, foie gras and marmalade; Paneer Roll of Cottage cheese, carrot, cabbage and garam masala; Margi Na Curry with Chicken, poppy seeds and coconut, Bhurani Gosht of Lamb with caramelized onions, red chilies and a spice blend and Palak Kofta, spinach dumplings with dill leaves and tomatoes.